Here at Sterling Kia, we like to help our customers and other drivers find ways to stay safe during winter months. While the act of driving during winter is itself somewhat hazardous, driving during the cold months also presents many other dangers. That said, drivers who take the time to pack comprehensive winter survival kits can provide themselves with a little bit of homemade good luck. Winter driving often results in loss of vehicular control. 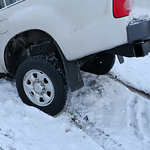 Practically speaking, this can mean that drivers leave roadways and end up getting stuck. To this end, a good winter survival kit should include signaling and digging equipment to help drivers free themselves from snowbanks and other hazards. A good set of durable traction mats can also save the day in such situations. In addition to digging and traction equipment, well-stocked winter survival kits should include a variety of food items. First on this list is liquid, and water is often the best for this purpose. In addition to liquids, dried or otherwise preserved foods can help to keep passenger and driver energy up during dangerous breakdowns. Finally, every winter weather survival kit should contain some kind of battery or hand powered signaling equipment. This could include radio transceivers as well as CB equipment.